Darren Cobley (# 41 in the list of senior men to represent Great Britain) was born on 13th June 1963 in Wolverton near Milton Keynes. By normal standards he was a late starter into the sport of roller speed skating. In fact, he didn't compete as a junior but entered his first race as a senior aged 16 on the 3rd February 1980. It was an indoor race event held by the Herne Bay Flyers club on the Pier Pavilion. Despite his training around the tight indoor circuit of the Wolverton Agora, Cobley would not progress through his heat. 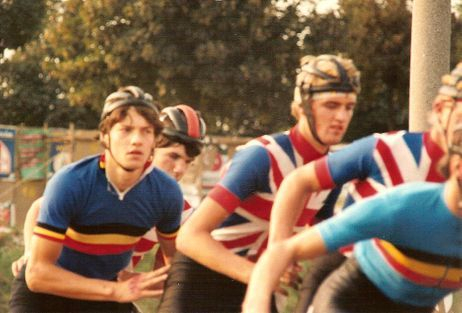 Cobley was skating for the Milton Keynes based New City Rollers back then and it wasn't long before he started to make his mark. Just over 12 months later and a week before his 18th birthday, Cobley secured his first victory. With 49 other skaters to beat Cobley won the prestigious Conrad Davis Trophy. The Darlaston track where the Birmingham club held the event suited Cobley down to the gound. Although outdoors, it was a tight circuit and the Agora training paid dividends. In fact, this victory was also Cobley's first medal. By October people were beginning to take note. Any initial thoughts that Cobley was just a "tight track" skater were soon put to bed when he finished 3rd in the 10 Mile Herne Bay Road Race behind Australian international Mike Stone and former European Champion, John E. Fry. Cobley looked around him and realised that if he was going to progress further he really needed a good team to work and train with. The McGrath brothers from the Birmingham club, Jerry, Mark and Kevin, were still a force to be reckoned with. 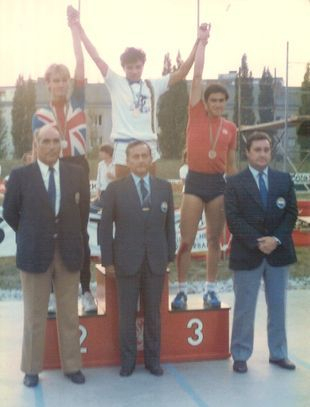 Jerry had been a European silver medallist in 1979 and was a current international. Birmingham's other international star, John Downing, had recently retired and this left a gap in the club which Cobley was only too willing to fill. 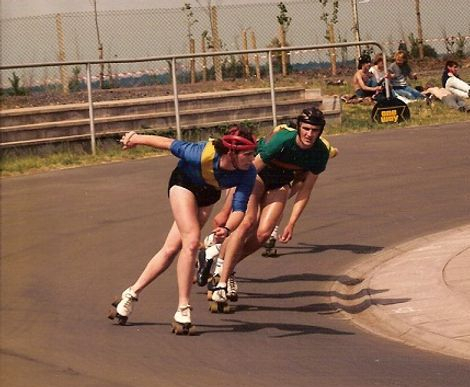 At the start of the 1982 season the Birmingham club looked formidable and on 23rd May Cobley and the McGrath's won the British Inter-Club Relay Championship in a photo finish with Mercia. Cobley would also go on to get a silver medal in the Southern Counties on the same day. But all was not well. Just two months later Cobley had left the club and was skating unattached in the white colours of the N.S.A. We can only speculate why Cobley did just 10 events for Birmingham before going it alone. What we do know for certain is that Jerry McGrath's performances were starting to be a little lack lustre at that time and he was not selected to represent his country for the forthcoming European or World Championships. McGrath's involvement with the sport, along with that of his brothers, effectively ceased overnight which meant that Cobley would be a lone skater anyway, whether he stayed with the club or not. There was some light at the end of the tunnel though as Cobley himself got his first call up for Great Britain. First in the European Championships in Jesi, Italy (road) and Santa Maria Nuova, Italy (track), then a few weeks later it was the World Championships in Finale Emila, Italy on both road and track. Whilst his individual performances were fairly average by comparison, he did help secure a silver medal for Britain in the European Championship track relay at Santa Maria Nuova. Just over two years had passed since Cobley first stepped onto a race track and now here he was, a European medallist. At the start of the 1983 season Cobley joined the Mercia club. The club was far more stable than the Birmingham club he had previously been in and was effectively run by triple European Champion and World medallist, John E. Fry. Although Fry was now 34, he was still on top of his game both domestically and internationally. Fry had been skating for almost 20 years by now, 14 of which had been as an international. Unlike the McGrath's, Fry had no intention of calling it a day and Cobley saw an ideal opportunity to develop his skating career still further. On 1st May 1983, in his first time out in a Mercia shirt, Cobley won with his new found team mate, Fry, in second place. As the season progressed it became evident that Cobley was now a major force to be reckoned with. Not only was he fast but he was strong. In the British Open Handicap Championship, the Jesson Cup, it was another 1-2 for the Mercia duo, this time Fry finishing ahead of Cobley. Cobley had to go it alone in the Southern Counties Championship (Fry being ineligible having been born in Birmingham) but showed he was more than capable of winning solo by taking the title. It was obvious that Fry and Cobley worked well together and more often than not the result was that either one or both of them ended up on the podium. By the time the British Championships proper came round Cobley was one of the clear favourites to take a gold medal. However, things did not quite go to plan. Certainly not as far as Cobley was concerned. The first event of the first weekend was the 5000 metres on Palmer Park, Reading and Cobley was just pipped to the post by Rohan Harlow (Herne Bay Flyers) for the title. Next up was the 20000 metres, the result of which would have a profound effect on Cobley's future skating career. Well into the race Tony Oulds, also of Mercia, made a decisive breakaway which was rapidly taking him away from the rest of the field. Oulds was an "ok" skater but he was not international level and nor was he considered an elite skater. He had been racing for some years but now at the age of 25 had never taken a medal in an individual British Championships, let alone a gold medal. As Oulds was getting further away Cobley turned to Fry and asked whether they should now start to go after him before he got too far. Fry flatly refused. It was Fry's belief that it didn't matter who won so long as they were in a Mercia shirt. He also recognised that Oulds may never get another chance to win any race let alone a British title and this was a way of giving something to a team mate that was unlikely to win anything else in his career. It soon became clear that Cobley was not happy with this scenario. He was of the firm belief that the best man should win. Oulds eventually lapped the field and with the track being some 480 metres round he had pretty much secured victory. In doing so uttered those now immortal words "catch that back you bastards". Cobley went along with it but such was his frustration that he decided to race Fry for the lesser places. Fry finished ahead of him by just 2/100th's of a second, but that didn't matter. What mattered to Fry was that his team mate had raced him - and suddenly the first cracks in the partnership started to appear. Despite a Mercia 1-2-3 all was not well within the camp. All that said, one can understand Cobley's point of view. Here he was, a European medallist and a British international but still to win a British Championship. Not only that but now Tony Oulds, a decent bloke but only a half decent skater, was British Champion before he was. It stung. Fry, on the other hand, had won some 13 British titles and Cobley felt it was easy for him to "give one away". The truth of the matter was that Fry's mentor, Ray Roberts, had instilled into him some 20 years previous the philosophy of team work that he now employed himself. But even 20 years ago, like Cobley, that philosophy also had its detractors within the camp. Roberts's team mate Ricky May felt (and still does) that the best man should win and that Championships need to be won not given. There is no right or wrong way in how Fry or Cobley thought races should be played out, or in fact what constitutes winning and giving. What was certain is that the two beliefs could not be mixed. The following weekend saw the second and final round of British Championships for the year. Cobley would take silver in the 300 metres time trial and a bronze in the 1500 metres. Once again he was selected for Great Britain and once again he would get a relay medal in the European Championships on the track in Cremona, Italy - alongside club mate, Fry and Herne Bay's John Quinney. He would also break into the top ten for the first time with a highest placing of 5th in the 1500 metres on the road. He would miss out on the World Championships in Argentina as Britain did not send a team due to the Falkland's conflict of 12 months previous. Back home, though, the rumblings within the club that had surfaced in July were all but put to bed and at the start of the 1984 season everyone was happy once more. Like the previous year Cobley started the season off with a victory. In fact, Cobley and Fry were once again prominent on the podium and on the 27th May at Tatem Park the duo won the two man relay event held by Alexandra Palace. It was an excellent preparation for the British Championships which would be held on the following weekend, 2nd and 3rd June. But once more, for Cobley, fortune was not shining on him and although it is not clear why, he withdrew from the Championships. The event was dominated by Fry and the recently returned from "retirement" John Mullane (Mercia), who between them worked together to win four titles, two each, on the new banked track at the Birmingham Wheels Adventure Park. 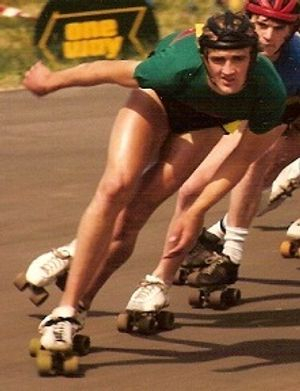 The only skater to prevent a Mercia clean sweep was Herne Bay's Rohan Harlow when he won the final event, the 20000 metres. The following weekend Cobley found himself back on the track and back to winning ways by taking victory in the prestigious Clarke Trophy, but a week on from that and the cracks that appeared 12 months earlier would now end up in a real rift. On 17th June 1984 the Northampton club put on a race on the Ling's Forum, effectively a school playground. In that race was local boy Darren Smith. Smith had previously skated for Northampton but was now skating unattached in the white colours of the N.S.A. with a view to joining Mercia for the 1985 season (the rules state that you cannot skate for more than one club in any one season) alongside his mentor, John Mullane. Smith had skated to an excellent 4th place in the British Championships and was starting to show some promise, although to be fair he still had some way to go. Smith made the final at Lings and went off on a break away getting a good distance ahead. Despite being "unattached" and skating in white he was effectively seen as a Mercia skater in the eyes of Fry who worked for him to increase the gap. Cobley, on the other hand, was torn. Not only was Smith not officially in the club, but also Cobley wanted to win and the memories of the Oulds incident came flooding back. Cobley therefore made efforts to catch the youngster which again resulted in Fry and Cobley at loggerheads and racing each other. Fry just managed to fend off Cobley to take second place behind Smith, but it was evident now that the Fry-Cobley partnership was at an end. The difference of opinion meant that Cobley would now skate the rest of the season unattached and once more found himself looking for a new club. (Ironically, it would be Smith's last race and he never would get to skate for Mercia, or any other club for that matter. A serious motor bike accident just a few days after his win left him with severe leg injuries which would end his skating career). Cobley would go on to win another of the classics, the "Invitation Five Mile" a few weeks later. This time he had no team around him and took on all comers strengthening his belief that the best man should win - and in this case had. Despite the turmoil domestically Fry and Cobley found themselves once more thrown together internationally. First off was the World Championships in Bogota, Colombia in August. Cobley would reach the final of the 1500 metres but would take a fall to rob him of any chance of a medal. Despite this he had now proven that he was a world class athlete and could mix it with the best of them on the world stage. Just a few weeks later was the European Championships in Vienna, Austria. Probably helped by the fact that Bogota was skated at altitude Cobley was on fire. On the track he would take silver in the 20000 metres and on the road he would take silver in the 5000 metres and bronze in both the 10000 metres and 20000 metres. 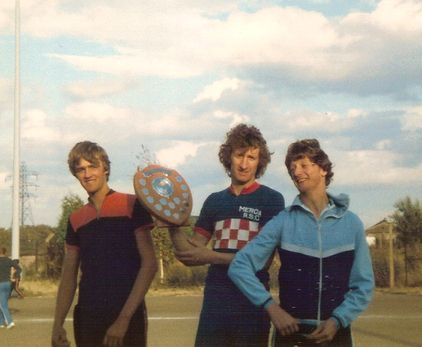 Then, in the last event, the relay, along with Fry and Rohan Harlow, Cobley would win his first European gold medal. His performance of five European medals at one Championships remains to this day the most prolific performance of any British senior male skater in a major Championship. Little did Cobley imagine when he stood on the podium to take his medal and Championship shirt that it would be the last time he would represent his country. Building up to the 1985 season word was out that Cobley had made the decision to join the Herne Bay Flyers club alongside fellow international Rohan Harlow. This would indeed be a virtually unstoppable team. With Junior European Champion Ashley Harlow, Rohan's younger brother, looking to move up to senior level Cobley's inclusion most likely meant that they would sweep all before them. Then, just before the start of the season Cobley did a dramatic turn around and joined the Alexandra Palace club. Why he changed his mind is not clear but the most likely reason was that former New City Rollers team mate, Lisa Smith, along with her father, Ted, were members. For some years Cobley and Smith had trained together. Smith had been a Junior European Champion in 1984 as well as taking medals in the Senior European Championships in Vienna the same year. She also lived just around the corner from Cobley so logistically it also made sense. Without a team of any note around him, many people thought this an error of judgment and history tells us that they are most likely correct. The first race of the 1984-85 season, the Jack Abrey Cup on October 14th 1984, saw Cobley triumph in his first outing in Palace colours. It was a dream start for Cobley, but very soon his skating career would start to unravel. His next medal of the 1985 season came at Herne Bay in May where he was third to the Harlow brothers. Although Ashley Harlow was just 15 this wasn't a major upset as Harlow was on home turf and he had already proven to be a class skater. A few weeks later Cobley was defending the Jack Abrey Cup but again lost out, this time to Rohan Harlow. His defence of the Clarke Trophy saw him again lose, this time to Ashley Harlow. Almost certainly doubts were beginning to creep in about whether he had made the right decision, but he knew he was still in form and the British Championships were just a few weeks away. He wanted that all elusive British title more than anything now. 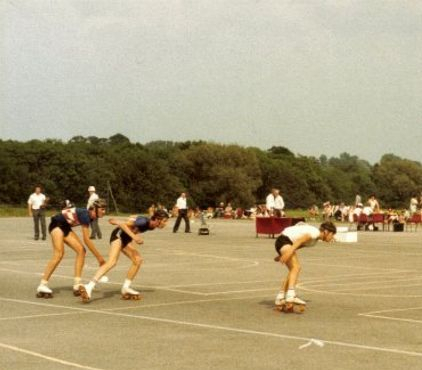 The weekend of the 1985 British Championships was the 13th and 14th July on Birmingham Wheels. The first event was the 1500 metres. Rohan Harlow would win with Cobley in third place, just behind defending Champion John Mullane. Next up was the 5000 metres and this time it was Ashley Harlow who would win with Cobley in second. Cobley could see the Harlow brothers were working well for each other and it obviously hurt him that the 15 year old from Herne Bay was a British Champion before he was. The following day did not fare any better. First up was the 300 metres time trial which was won by his former team mate John E. Fry with the Harlow brothers taking second and third. The final event was the 20000 metres. It was all or nothing for Cobley and the last lap saw him pitted against defending Champion, Rohan Harlow. As they crossed the line it was difficult to call. Even the spectators were split as to who had won. Then the result was announced - despite being given the same time the winner was declared as Rohan Harlow. It was all too much to bear for Cobley who once more had to settle for a silver medal. That event was the last time Cobley would set foot on any track in anger. The British team was announced for the forthcoming European Championships in Cassano d'Adda, Italy and Cobley's name wasn't in it. Nor, despite having entered, did he take part in the next round of British Championships scheduled for September. He only won one race skating for Alexandra Palace, but more importantly for him he was never crowned individual British Champion. Even to this day Darren Cobley remains an enigma. Undoubtedly he was one of the most talented British skaters of his generation but he was unsettled. It wasn't so much that the grass was always greener, he simply couldn't find the right team of skaters in his own mind that suited his style of skating. Having skated for four clubs in five years it was difficult for Cobley to decide what to do next. He was more than capable of winning a British title, that much is certain, however, in his relatively short career circumstances seemed always to dictate that it was never going to happen. To win a race in Britain in the mid 1980's you had to be special. To put it into perspective Cobley was a top ten World class skater with no fewer than seven European medals gained in just three years, but no British title. In contrast, Sutton Atkins, one of Britain's more recent skating talent has over 50 British titles but has never won a medal at an "absolute" World or European Championships (although he was World Masters Marathon Champion in 2012). Cobley has the unenviable title of being the most internationally decorated post war male skater not to have won a British Championship, but even now, decades later, his name still crops up on occasion when elite skaters are talked about. One could suggest that his international performances far outweigh any domestic shortfall and you wouldn't find many people that disagree. People forget that he was just 22 when he quit and should he have continued would almost certainly have taken at least one British title, but it wasn't to be. Despite his all but too brief career his performances and achievements between 1980 and 1985 mean that Darren Cobley will always be remembered as a British Skating Legend.